Craftsmanship abound in this Prestigious Custom Home, on the Hudson River. 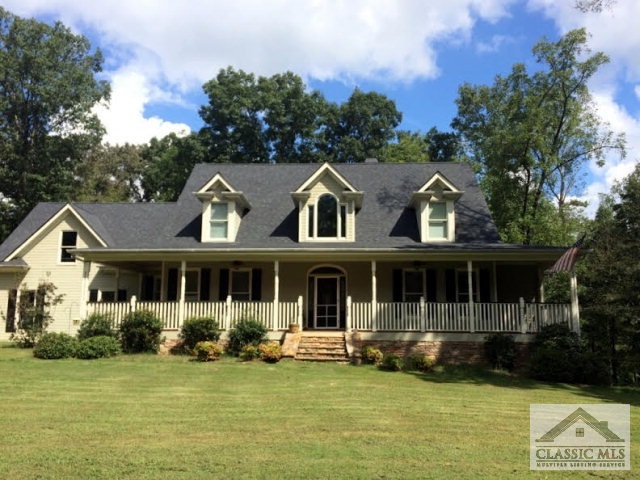 4BR/4.5BA Executive Home with Hardwoods & Heavy Trim throughout is sure to please. Fabulous Master on Main w Luxury Bath & Sep Vanities, H/H Walk-in Closets. All Baths have Granite & Tile. Chef Kitchen w Granite, Stained Wood Cabinet, Island & Breakfast Area. Living Rm w Stone Fireplace, French Doors to Large Covered Deck. 3 Large Bed Upstairs with Baths. Custom Built Office w Built in Bookcases&Desk. Large Dining w coffered ceiling.2 Laundry Rms. Full partially Finished Bsmnt. Rocking Chair Porch. All listings featuring the "Athens GA Area" as the source are provided by "Athens GA Area Association of Realtors" and RealtyWeb.net. This information is not verified for authenticity or accuracy and is not guaranteed. 321 Borders Drive, Commerce GA 30530 is a Home, with 4 bedrooms which is recently sold, it has 0 sqft, 5+ - 6 sized lot, and Garage parking. A comparable Home, has 2 bedrooms and 1 baths, it was built in and is located at 574 Craig Rd Commerce GA 30530 and for sale by its owner at $ 105,000. This home is located in the city of Commerce , in zip code 30530, this Banks County Home, it is in the No Recorded Subdivision Subdivision, and Buckeye Trails are nearby neighborhoods.